Gundam Versus Review (PS4) - Best Gundam Game Ever? Let’s face the facts: giant fighting robots are just cool. I’ve always had a fascination with mechas, and a large part of this is due to the Mobile Suit Gundam series. I have vivid memories of watching one of its many incarnations as a kid, and since then I’ve drifted in and out of the franchise as its continued to be a colossal hit in Japan. While I haven’t watched a Gundam series since Unicorn aired a few years ago, I still always look forward to seeing a new video game release since I like seeing giant robots duke it out on my television. I know I’m not alone in this interest, and that’s why I wish that Gundam Versus, the latest game based upon Gundam to make it stateside, had a better tutorial. The 3D fighting game has layers of complexity to it, as players have several different types of melee and ranged attacks, but the tutorial does little to explain things clearly. The issue is that it gives players an info dump at the beginning of each mission, then just puts the player in a room with an opponent. To advance, they don’t have to use the skill that they were supposedly taught, they just have to defeat the on-screen enemy. It can be quite overwhelming for a new player, and Bandai Namco should look to games like Guilty Gear Xrd for how to better teach players the basics. Thankfully for me, this wasn’t my first rodeo with a Gundam game so I was less confused than most will be upon picking up the fighting game. I got down the basics by jumping into a few free battle matches on easy (which had two teams of Gundams going at it), and was able to work out the majority of the mechanics myself. I then redid the tutorial after I had a basic grasp, and things went very smoothly. I feel this is necessary since there’s quite a few quirks beyond learning the game’s 10-input control scheme. For example, to guard incoming attacks I had to do an unnatural motion of down then up on the left analog stick, and to cancel animations I used the right analog stick. If this sounds overly complex, it really is, but thankfully the on-screen action is fun enough once you get it down to be worth the hassle. Actually getting into a match and piloting a mecha is where Gundam Versus really shines. Flying through the air, dodging bullets while using buildings as cover, and getting in close to deliver a devastating attack with a gigantic sword feels great. It was practically a dream come true for my childhood self, and matches are often intense affairs that come down to what team of two can execute on a strategy. There are so many different Gundams that can be piloted, each with their own attacks (and there are selectable skills as well adding another layer of complexity), so there’s bound to be one that appeals to a player’s combat style. I wound up testing out many different robots in the game’s single-player offerings. There are two main solo modes: Ultimate Battle, a survival mode, and Trial Battle, a series of missions. Both are totally serviceable (although if you’re like me, you’ll probably stop playing Ultimate Battle once you die on the 40th wave of 50 and lose all of your progress), but aren’t likely to be something that players will spend hours playing. There are some cool opportunities to control gigantic boss characters in Trial Battle, though, so it’s definitely recommended to try the modes out. There are some interesting ideas, but for the most part the solo content is pretty underwhelming. I’d love to see a more structured campaign that went through some Gundam story arcs, but the focus is definitely on human-versus-human play. 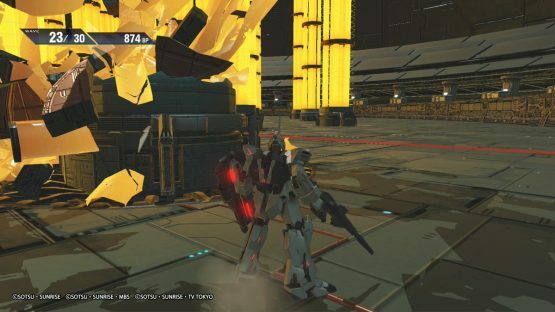 Thankfully, this is where Gundam Versus is rich in features as players can battle in all types of configurations. From one-on-one to teams of three, there are plenty of ways to battle it out, and it all winds up being a blast. Two-on-two is definitely the more traditional way to play Gundam Versus, but I found the one-on-one offering a lot of fun. Maybe it’s because I don’t like my success to depend on another person’s play, but I found myself gravitating to that mode more often than not. That’s not to say I ignored the other modes, though, as three-on-three battles are way too hectic and awesome to watch unfold for me to ignore. What will keep players coming back to Gundam Versus is the huge amount of unlockable content. From different Striker abilities to different pilots and player emblems, there are a ton of things to spend Gundam Points on. While earning them, players will also be leveling up individual Gundams. As someone that likes to see numbers go up and watch things on a checklist get crossed off, Gundam Versus appealed to me from a completionist standpoint. Bandai Namco expertly dangles a carrot in front of the player, and I’ll keep on chasing it for the foreseeable future. 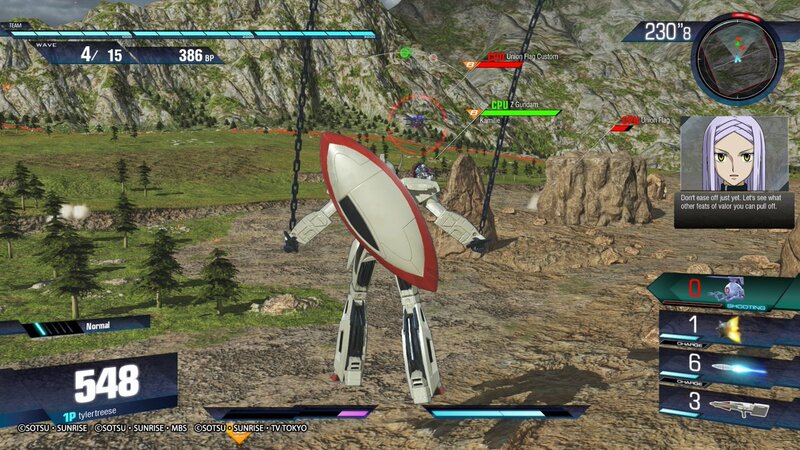 While there are a few too many barriers to entry, there’s no denying that Gundam Versus provides some incredible robot-on-robot action. Each individual Gundam brings with it its own intricacies to master, and it’s highly satisfying once you’re flying your mecha around like its second-nature. There’s still room for improvement, as the single-player modes are uncaptivating at best, but the competitive multiplayer is top-notch. Gundam Versus review code provided by publisher. Version 1.05 reviewed on PlayStation 4 Pro. For more information on scoring, please read our Review Policy.